3 for 2 across our Optimum Nutrition Cake Bites range (all flavours) this month. Add 3 to your basket and the cheapest will be free. 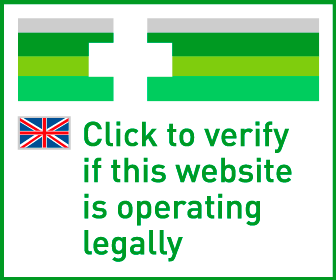 Free UK delivery on all orders of £30 or more! Allergen Warning: Contains: Milk and Soy. May contain peanuts, tree nuts, eggs and wheat. Enjoy these Cake Bites as part of a healthy diet. Perfect at any time of the day as a nutritious, protein-rich snack or as a post-meal dessert. Taste is what separates Cake Bites from any similar high protein product. They stomp all over protein bars and compared to other dessert style protein foods, these are made using only the very best forms of protein delivering 20g of protein per serving. With a light, airy interior, and coated layers they deliver outstanding taste. The nutritional profile of Cake Bites makes them ideal as a snack at any time of the day and with their high protein content and low fat levels they can work with any type of diet. We think anyone who follows a healthy diet focused around high protein levels will fall in love with these. 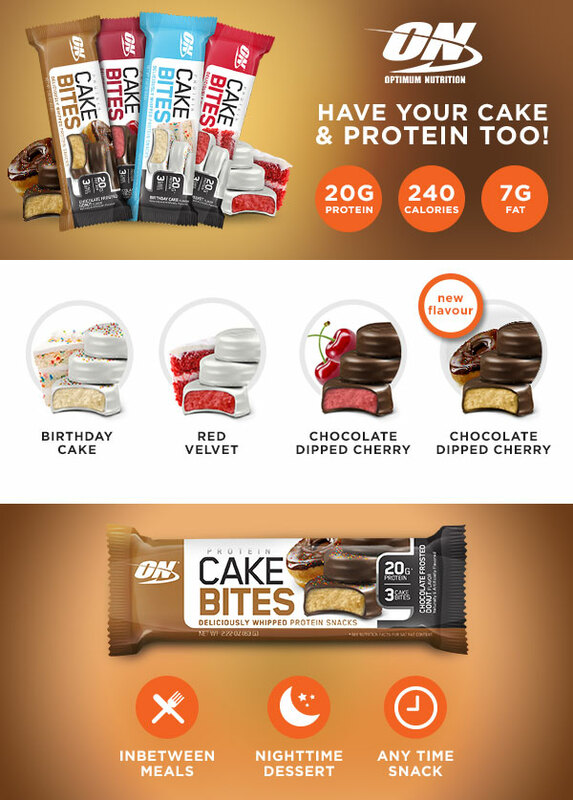 Optimum Nutrition have introduced a few innovations over the years, but since the introduction of Amino Energy, which established the anytime energy category they have been quiet but when we heard about their plans for making miniature protein cakes, our dessert loving minds were overwhelmed by excitement. In this review the most important thing to note is that this is not a small protein bar, something which would have been an immense disappointment. Instead, Cake Bites is a delicious whipped cake made in a bite-size format which means you can enjoy it at any time of the day; as a snack between meals without ruining your appetite, as a post-meal dessert, or as a night time treat while you relax at home. While the nutritional composition is great we want to start off with the factor that can turn a regular protein food from good to great, and that is how it tastes. With a name like Cake Bites expectations are going to be high. When you unpeel the wrapper the first thing you notice is that in each wrapper there are three individual portions of protein cakes, each one coated in mouthwatering frosting, just like a real cake. Senses overcome, here is our review on each of the flavours. As soon as we saw the white frosted layer with little millions on top we thought this was going to be our favourite. Each small cake retains an appealing round shape which was difficult to resist swallowing whole but we took a bite and immediately got a flavour hit which we can only say resembled actual birthday cake to a tee, the frosting and the millions making a perfect combination followed by the inside which was pleasingly sweet without being overpoweringly so. With each Cake Bite being quite small, we think people will really struggle with just one of these. As with all of the Cake Bites flavours each cake is whipped meaning it contains more air than a standard protein bar making the act of eating this much closer to a real cake than to the taffy texture of a protein bar. We definitely expect to see more brands coming out with whipped protein foods given how well this is executed. Red Velvet Cake is a flavour which is relatively new to the protein market, the first time we had this was in Body Nutrition's Trutein and that was an immediate hit among Predator customers so we expected similar greatness here. When you take a bit of this you get the familiar taste of Red Velvet and even moreso than the Birthday Cake version, we think this is very close to the real thing. The combination of a frosted layer and Red Velvet's creamy, sweet deliciousness makes this another immense flavour from ON. We were somewhat suprised at this flavour. Cherry is a flavour that not everybody loves but what we will say is that if you like it then you will love this but for us this is probably the flavour which is relatively the weakest. With that said, compared to a chocolate cherry flavoured protein bar, this absolutely blows away the competition. The newest flavour released and we would say the best. The Donut (or should that be doughnut flavour!) doesnt have the texture of a doughnut (as its the same texture as the other cake bite flavours) but it doesnt have a sweet doughnut taste which we loved. We've had a few dessert style protein snacks in the past but invariably they tend to contain plenty of soy protein, a protein many would rather avoid. Cake Bites only include the very highest quality of protein in whey isolate, milk isolate, whey concentrate and milk protein concentrate which means each serving of Cake Bites results in 20g of protein from sources of protein rich in recovery boosting bcaa's. You don't normally think of cake as being conducive to building muscle but Optimum Nutrition's version most certainly will help you in that regard. We can see a nation of Cake Bites addicts as soon as people try these. They really are an exceptional product which is innovative in a number of areas; the whipped manufacturing process, the bite-sized snacks and of course Optimum managing to make them taste amazing while retaining a high quality nutritional profile. Love this decadent but healty stuff! Not that naughty and very nice. Good tasting and very more-ish, macros are fairly good too. As part of a self-disciplined nutritional regime, these are a rare treat. I will buy again. Really tasty snack with decent nutritional values. Tasty protein snack. I've had these a few times from Predator Nutrition. Very tasty. Love Them - Well Worth Buying! I have the cherry flavour, very light and easy to eat and a great snack with lots of protein. Because they are in packs of three you can just nibble on them instead of eating one stodgy bar - well worth buying! Great tasting healthy treat, just tried cherry, looking forward to trying others! Great tasting! Although I wouldn’t say it stands out form the crowd, a solid bar but if you’re looking for something extra, this isn’t it..
Nice tasting bar. Can’t afford the price though. But a treat every now and then. Didn't even get to try! My girlfriend ate all of these before I even got a bite, she certainly enjoyed them though! Decent tasting snack. Kills a craving for chocolate, good 20g serving of protein with only 4g of sugar. Had as a free tester, don't think I'd purchase at full price. Better snacks out there. Milky Way protein bars taste much better but have more sugar. CHERRY FLAVOUR CAKE BITES – WHAT THE WORLD’S BEEN WAITING FOR! At last, manufacturers of protein bars have woken up and made a cherry flavour variety! I was misled by the name ‘Cake Bites’. I was expecting something light and insubstantial, like a Victoria sponge, but they’re not; they’re like a delicious, creamy fondant, coated in good quality dark chocolate flavour. And there are three pieces in the packet, so you could even share one if you had a mind to – or perhaps not! One of my favourite protein snacks at the moment, really tasty and good texture. Has the consistency of nougat. The cherry flavour one is tasty enough. I really like these a lot! Nice to have a bit of a different twist on my usual collection of go-to protein 'bars'. These are a lovely texture, nice and soft and you can eat the 3 small cakes separately, although I always eat the 3 as they're very tasty. I've tried nearly all the flavours but the mint ones and blueberry cheesecake ones are my favourite and the ones I keep going back to. They're pretty pricey if not on offer mind which is why I gave them 4 stars not 5. These taste great and can be grazed on if you are worried about macros. My wife, Julie, takes just one from the pack to work with her. In all honesty though, we both intermittent fast for at least 16 hrs each day and the addition of great tasting higher protein treats has not affected our constantly ripped condition for one moment. In fact, more often it fills out our physiques and muscle to give an improved appearance. Famine and feast its the only way to progress. I love these, they are even better than the unhealthy bars you can buy from stores! These remind me of the mints we used to have around Xmas every year. They are genuinely good tasting and quite filling. And if you smaller or like to exert some self-control you can eat them individually like my wife does. I really love the birthday cake flavor!! It has a strong and sweet flavor and it doesn't have the protein aftertaste at all. Perfect snack! Doesn't taste as good as similarly priced bars, and the cake aren't individually wrapped, which seems to defeat the point. Love these. As good as bars like combat crunch and carb killa are, these are on another level thanks to the texture which is unlike any other protein bar/brownie out there - light, fluffy and addictive! Tasted really nice but the only downside is the cost. The 20g protein is spread throughout the 3 pieces.